Our condo is a nicely furnished and well maintained, fifth floor townhouse condo with approximately 1,000 square-feet of living space and two balconies. The master bedroom has a breathtaking view of the Gulf, while the living room has a beautiful view of Phillips Inlet. The condo is tucked away on the western end of Bay County, in the enclosed community of Carrilon Beach. There are shops and restaurants in Carrilon, as well as Pier Park which is about 5 miles away. Privacy and seclusion is our trademark; yet we're close enough to all the daily activities of Panama City. My husband, Bill, and I are retired civil servants. Between us, we worked for the Marine Corps, Navy, Army and Air Force. I ended my career working for the Veterans Administration in 2010. We live in Port Orange, FL and have lived in Singapore and Japan but our hearts are still in Georgia! We have 3 grown children and 7 perfect grandchildren that we don't get to spoil as often as we would like. I had relatives that lived in Panama City Beach when I was a child. Pinnacle Port reminds me of what the beach was like then. Pinnacle Port is located on the Gulf and Phillips Inlet and is in the gated community of Carillon Beach. Being surrounded by water and not condos is what drew me to Pinnacle Port. Pinnacle Port is not only located on the Gulf of Mexico but also Phillips Inlet. Master bedroom has Gulf view and Living room balcony is looking out at Lake Powell. Credit cards accepted.. Housekeeping cleans prior to arrivals and will leave complimentary toilet paper, 2 dishwasher starter packs and small bath soaps. There are 2 grocery stores just outside of Carillon Beach to buy supplies you may need during your stay. 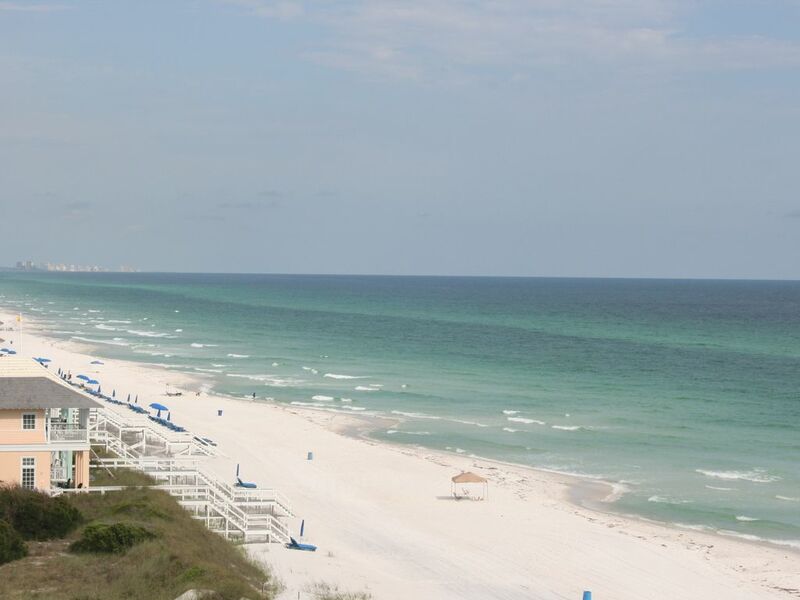 Great condo, wonderful complex, beautiful beach! Can't wait for next time!! Thank you guys! You got to see our remodeled kitchen and living room before us. I'm looking forward to you being our guests on future trips. We had a wonderful time at this condo, perfect size for a family of 4. Great atmosphere, not over crowded and still within short distances to anything in PCB you wanted to do. Thank you for taking the time to leave this great review. I hope you will keep us in mind for your future trips to PCB. What a wonderful time we had at Pinnacle Port and your condo. The place was immaculate and just as advertised. We had no problems what so ever and out of 4 families in our group, everyone agreed we had the best condo. We will be back next year! Thanks again for the wonderful accommodations! I loved hearing you enjoyed Pinnacle Port but especially that you loved our condo and will return! Thank you both for the review. I can't wait to have you back again and again. We had a great time here at Pinnacle port . Room was clean and plenty of room. Took a little while for the A/C to get cold, but still warm upstairs. Nice area to be away from all the "younger" crowd. Easy access to beach road or back beach road. We plan on being back next year too. Thanks Kay for the easy process. Thank you for your review. The upstairs master can get a little warm when the drapes are left open during the time the hot part of the day. I'm glad you are planning a return trip next year. Can't wait to hear from you again! Thank you, Jimmy. I hope you got some pictures of all the fish! I appreciate your kind words and great review and look forward to renting to you many more times. Amazing views, clean, comfortable, convenient, secure, well furnished and quiet. This was the first time my family and I vacationed at Pinnacle Port, FL and 2 weeks later I still miss being there! The condo had two balconies with amazing breath taking views. One view faced the beautiful ocean and the other view faced a very well kept lake. The condo was very clean and was furnished very comfortably (beds, couch, recliner and other comfortable chairs, plus the dining room table). The kitchen had absolutely everything one would need to cook and eat meals right there every night. I also enjoyed the fact of having our own washer and dryer. The grounds of Pinnacle Port were also very well maintained. Through out every day you will see grounds keepers working very hard to keep the property looking breath taking. We were also very impressed by the security, we don't normally let our children (one is 15 and one is 12) ride their bikes in unusual places but we felt safe enough to allow that here due to having to have proof to be within Pinnacle Port. The condo owner didn't not bother us at all during our stay but got right back to me when I had an appliance question for her. This was an extremely relaxing and beautiful vacation!!! We would go back without a doubt!!! Thank you for this wonderful review of our place. Our family loves Pinnacle Port but I love it when our guests love it as much as us! You covered the fact of why it's such a wonderful place for families to spend time together. I hope you will contact me again on your next trip to the beach.